[S487] John Bass, Documents MVW file. She was the daughter of Richard Jones and Jane Harris. [S547] Fred Harvey Williiams, "Basse Family," e-mail to Margot Woodrough, Feb 2004. [S635] Unknown compiler, "NC State Archives", Ancestral File. PRONUNCIATION: Before telling the Jordan story, we should say something about the pronunciation of the surname. Jordan in many cases was and is spoken as to rhyme with burden. Reports tell of many Jordan families in Virginia and elsewhere today who use this traditional pronunciation: Jurden. And they are among the descendants of Samuel Jordan. It is important to know the pronunciation of the surname while reading the Jordan story. They waited there at Plymouth Harbor that June day in 1609, some 500 souls standing ready to embark on the boldest journey of their lives. After more than three months of planning, the greatly anticipated voyage was about to begin. This was no ordinary sea voyage. Instead of one ship, or perhaps two or three, this undertaking involved a fleet of eight English ships carrying about 550 passengers. The history-making effort, three months ahead of The Mayflower, was called The Third Supply, a somewhat frenzied commercial endeavor to deliver passengers and supplies to Virginia, a fledgling corporation known formally as The Virginia Company and comprising two joint stock companies, The Virginia Company of London and The Virginia Company of Plymouth. Some passengers waiting to board were nobles and wealthy merchants, who also were stockholders. Others were poor people who accepted contracts to provide seven years of labor in exchange for free ship fare to the New World. Finally, the signal was given, and the crews of each ship began the process of boarding the passengers. As in all such beginnings, there was a mood of restlessness, hope, good humor and fear. Our ancestor Samuel Jordan stepped aboard The Sea Venture, the lead ship of the flotilla. So did John Rolfe, who later became half of the Pocahontas story. So did Thomas Gates, Virginia governor in 1611-1614. So did Admiral George Somers, who commanded the eight-ship fleet. Samuel Jordan was in prestigious company. Jordan today is listed in Wikipedia, an internet source, on an equal footing with both Gates and Somers, but we should not place too much weight on that because Wikipedia sometimes puts out misleading information or just plain errors. Still, Wikipedia may be on to something here. As we shall soon see, Samuel Jordan was a key player in the development of the New World. And he was the father of our ancestor Mary Jordan, who married Nathaniel Basse in 1613. The Sea Venture was new and unique. Old English ships had proven inadequate to safely deliver the number of passengers being placed on them. In response to this inadequacy, investors of The Virginia Company paid 1,500 pounds to have The Sea Venture built. Upon completion, it was England’s first purpose-designed emigrant ship, and its constructional concept was different in many aspects from all other ships, but the complicated facts of that design can lead us into the murkiness of minutiae, a bad place to be if we are not seasoned veterans with vast maritime experience. Suffice it to say that The Sea Venture was a new approach to sailing, and much of England was anxious to learn how her voyage went. They would know soon enough, and nobody at sea or nobody in Virginia would be claiming bragging rights. The Sea Venture was in serious trouble. About seven weeks out, the fleet of ships ran into a powerful storm, most likely a hurricane. Within an hour, the ships were separated, and few of the passengers could see anything or had the slightest notion of where they were headed. Most ships normally survived such storms, and all ships in this eight-ship fleet, in fact, did survive the storm, except one: The Sea Venture. What was the problem? Bad design? Too heavy? Bad sails? Bad lumber? Bad engineering? No, nothing that complicated. It was the wet caulking. Not enough time was allowed for the caulking to dry. The other ships did not have that problem, of course, because they were seasoned. It may have been the first day of the storm, perhaps the second, but at some point during the relentless siege, Admiral Somers, who was master of The Sea Venture, became aware that water was making its way into the lower levels. All hands worked feverishly dipping out water and dumping heavy canons, but it all was to no avail. Doom seemed imminent, and Admiral Somers headed the ship – terribly off course by now – in the direction of land about a mile away. According to accounts, the ship came to a stop, wedged in the cradle of two coral reefs. It was not as bad as it seemed at first. Many survivors were able to reach land, which was Bermuda. News of this terrible storm at sea may have been the first of all known reports concerning the infamous Bermuda Triangle. Among the survivors was Samuel Jordan. Also John Rolfe, his wife and child. Also Thomas Gates. Also Admiral Somers. Then came the longest journey of all, 10 months of hard labor, pain, despair, hope, triumph – and in the end the successful construction of two smaller ships that would take the survivors to Jamestown. The new ships were made from shipwreck timbers and other salvaged ship parts combined with such native resources as cedar. By all reckoning this achievement by the survivors of The Sea Venture was one of the greatest in sailing history. They had no way of knowing then, though. They were only trying to get by – to survive. There was one other significant survivor. His name was Sylvester Jordain, and most historians believe he was a relative to Samuel Jordan, perhaps a cousin or brother. But he spelled his surname differently. Sylvester Jordain wrote an account of the storm in 1609, apparently while stranded in Bermuda. A London publisher somehow obtained a copy of Jordain’s journal, took it to press, and put the printed journal on the market. It was an overnight hit. Apparently one of the early avid readers of Jordain’s account was William Shakespeare, for in November 1611, he staged the first recorded performance of The Tempest before King James I and his court at Whitehall Palace. The play later was staged at The Globe Theater and Blackfriars Theatre. The Tempest is vastly important to the literary world. The play is considered to be Shakespeare’s finest, but it poses a perplexing question. Did Shakespeare take inspiration from Jordain’s work? Some historical analysts say no, noting that the story is located in the Mediterranean, but they acknowledge that the storyline has aspects similar to conditions in the Bermudas. Also, many Shakespeare devotees point to his description of islands in the distance as still-vex’d Bermoothes, which sounds remarkably in the same linguistic ballpark as Bermudas. The islands often were called the Bermoodies in documents of that era. Therefore it is likely that some or many in the audience, especially King James I, would recognize the word Bermoothes as a tip of the hat to the Bermuda experience. Another feature of the story is that the lead ship, which seemed to be shipwrecked on an island, was part of a fleet and that the fleet regrouped after the storm and continued toward Naples since the crews assumed the lead ship and all aboard were lost. This part of the play is very similar to what happened in the Bermudas. The lead vessel shipwrecked, the other ships in the fleet survived the storm and continued on to Jamestown, their captains assuming that the lead ship and all aboard were lost. Finally, one part of the play sounds remarkably like the Jamestown experience. Prospero tells his slave Caliban to fetch some firewood for him. An angered Caliban curses Prospero, who then threatens to punish him. Caliban then reminds Prospero that this was his island long before Prospero arrived, also that Prospero was cooperative and kind to him at first, actually teaching him about the sun and the moon. Caliban recalls that he loved Prospero and showed him all the secret places of the island, and then Prospero turned on him, trapped him and made him a slave. Enslavement of Indians at Jamestown was not uncommon, and the slaves euphemistically were called servants. But when we analyze The Tempest we see that the storm really is not the focus of the play. The storm in The Tempest is like a stage prop. Action revolves around it. The focus is on volatile human behavior, struggle, and relationships. It could take place in any other location, under any other circumstance. On the whole, it appears to be allegorical of human conflict. Shakespeare had more than one account of the storm to draw from. In addition to Jordain’s, he had an account by William Strachey, a noted English writer who also was aboard The Sea Venture. Many historians believe that if Shakespeare used a single source, it would be Strachey’s account, and they point to textural similarities in Strachey’s report and the play. A member of The Virginia Company, Strachey eventually penned firsthand descriptions of early Virginia and Powhatan society. For four and twenty hours the storm, in a restless tumult, had blown so exceedingly as we could not apprehend in our imaginations any possibility of greater violence; yet did we still find it, not only more terrible but more constant, fury added to fury; and one storm, urging a second more outrageous than the former... sometimes strikes in our ship amongst women and passengers not used to such hurly and discomforts, made us look one upon the other with troubled hearts and panting bosoms…. We could not find a copy of Jordain’s account, but commentaries by historians do not question whether he wrote an account, which was published in London. In addition to the accounts by Jordain and Stachey, other accounts have been cited but none documented. Some Jordan family researchers say that Samuel Jordan wrote an account, but no proof of that has been forthcoming. Even Admiral Somers has been mentioned as providing a written account, but again no proof. Perhaps no single account was used. Perhaps Shakespeare read all the accounts that were available in London and gleaned something from each. But let’s put our focus where it belongs: Samuel Jordan. Survivors of The Sea Venture arrived at Jamestown on Deliverance and Patience, the ships they had built on the Bermuda island, in 1610, and what the survivors saw there – what Samuel Jordan and the others saw there – was appalling. Only 60 people, or thereabouts, were found of the 500 who had preceded them. Some of these 60 settlers themselves were dying. Most appeared to be in great need of food. Everything was in disarray. Vacant stares had replaced a purpose for living. Everyone planned to abandon Jamestown and return to England. But the arrival of Deliverance and Patience, carrying supplies and new settlers, seemed to encourage these suffering souls. Then the fortuitous and almost concurrent arrival of another supply ship with more settlers restored hope, and immediate efforts went into returning a degree of health and enterprise to the area. Good health, however, was not everything the settlers needed. What they needed most at this crucial period – this narrow portal into what we now call America – was strong leadership and ongoing hope. Samuel Jordan and other planters apparently provided both. Jordan established his plantation in 1613 near the confluence of the James and Appomattox rivers in the general area of what is now called Charles City. His plantation, along with five others established in 1613, seems to have created a positive atmosphere of enterprise, and judging by the continuing progress in succeeding years, that positive air was exactly what Virginia needed. Without Samuel Jordan and five others who started plantations in 1613, America as we know it might never have developed. Jordan was there at that narrow portal, that incredibly crucial time in history, and he did what he knew he had to do – offer leadership and tireless enterprise. Jordan named his plantation Diggs His Hundred, which is an oddity excelling all other oddities in colonial history. The name gives us a hint that Samuel Jordan had a sense of humor. The second hint may be more than a hint. After building his home in what would later become Charles City, he named the home Beggar’s Bush. Wikipedia erroneously reports that Jordan took the name from John Fletcher’s play called Beggar’s Bush. Jordan chose the name Beggar’s Bush around 1612, certainly no later than 1618 or so, but Fletcher did not write his play until 1622. If anything, Fletcher stole Jordan’s idea, but that suggestion is a sophomoric attempt at bad humor, given the fact that Fletcher and Jordan lived on separate continents. There probably is a more sensible explanation. Beggar’s bush may have been a common expression in 17th Century England, a reference to vagabonds and where they spent the night. Vagabonds were wandering ne’er-do-wells and often beggars, and their realm was bush. Think of bush as being an outback to get a clearer meaning. Jordan perhaps was humorously calling himself a vagabond reduced to begging and living on uncleared land – the bush. Despite the gloom around him, it seems, Jordan chose to live on the brighter side as he developed his plantation. Thus we ever dance and sing. This is how many people of Samuel Jordan’s day talked. Out on the plantation, the works of Fletcher, Beaumont and Shakespeare would be totally understood. But we were discussing Diggs His Hundred. Before starting the plantation, Jordan obtained a land grant of 450 acres in his own right and 250 additional acres for transporting his five servants – 50 acres for each. The year of the land grant apparently was 1611. According to one report, Jordan changed the name Diggs His Hundred to Charles Hundred a few years later. The word hundred was used by many planters to indicate the number of acres they had in cultivation, and 100 was the most common acreage. Jordan’s plantation later, perhaps as soon as 1619, was called Jordan’s Journey, with journey probably referring to Samuel Jordan’s long journey from England, to Bermuda, to Virginia, and possibly to his 10-year emotional journey of struggle and progress at Jamestown between 1610 and 1620. The word plantation was not commonly used in the 17th century. Take away the mythical romance of it all, and plantation means nothing more than farm. SOURCE: The First Seventeen Years: Virginia 1607-1624. Charles E. Hatch Jr.
Further indicting Shirley Plantation for its false claims are the actual facts concerning establishment of five plantations before 1613. In 1609: The Falls, Hog Island, and Nansemond. 1610: Kecoughtan/Elizabeth City. 1611: Coxendale. 1612: None. The Shirley site claims Shirley was the first plantation in 1613, but even if we allow that – which we don’t – there were plantations there before 1613. SOURCE: The First Seventeen Years: Virginia 1607-1624 by Charles E. Hatch Jr.
Additionally, there were these. 1617: Argall Town, Martin's Brandon, Mulberry Island, Pasbehegh Terr., and Smith's [Southampton] Hundred. 1618: Flowerdieu Hundred/Piercey's Hundred, Maycock's Plantation, and Tanks Weyanoke. 1619: Archer's Hope, Arrahatock, Berkeley Town and Hundred, The College Lands, Falling Creek, Jordan's Journey, Lawne's Plantation, Merchant's Hope/Powle-brooke, Ward's Plantation, Westover, and Woodleefe's Plantation. 1620: Causey's Care, Paces-Paines, and Piercey's Plantation. These plantations and the years they were established show the solid development of colonial Virginia in 1610 to 1620, especially in 1619 when growth surged. It was the year Jordan’s Journey was started. The decade was crucial in the development of Virginia, and Samuel Jordan played a key role in it. There were others there paving the way for a profitable Virginia, chief among them John Rolfe, whose property abutted Jordan’s land, whose wife and child had died at Bermuda. He would marry Pocahontas, daughter of the Powhatan ruler, in 1614. These are the plantations in the next decade. 1621: Blunt Point, Treasurer's Plantation (George Sandys), Truelove's Plantation, and Warrascyack (Bennett's Plantation. 1622: Basse's Choyce, Edward Blaney's Plantation, Capt. Roger Smith's Plantation, Capt. Samuel Mathews’ Plantation, Captaine Spilmans Divident, Edward Blaney's Plantation, Hugh Crowder's Plantation, Proctor's Plantation, Sheffield's Plantation, and Swinhows. 1623: Chaplain's Choice. 1624: Burrow's Mount. History gives John Rolfe the credit for introducing tobacco to the colony in 1614. This probably is true, but other planters contributed to the colonial effort in tobacco to make a profit for The Virginia Company. It would be logical for Jordan to raise tobacco because it was a big money crop, and corporations always like big money. Sale of tobacco kept rising, along with the prices, and by 1619 land was divided among the colonists, and that apparently set into motion a tobacco boom. That soon changed, though, when King James I took over The Virginia Company in 1624 and made it a Crown company. Raising anything less profitable than tobacco could invite more than a slap on the wrist. It could amount to forfeiture of the land. We have no proof of that, however. Tobacco was not worth its weight in gold but it was worth enough to actually be used as currency. Preachers, for example, were paid with tobacco, which they could then trade, perhaps at a profit. To illustrate the hazards of irritating royalty, of disobeying orders, of not doing the proper thing, Sir Walter Raleigh was beheaded in 1618 although his life consisted of a series of accomplishments for the Crown, such as sailing several times to the North American continent with the purpose of exploring and colonizing the New World. We do not know the precise number of plantations in 1619, but if they all continued in operation from the start, there were 20 at the beginning of 1619. Looking at the record can give the impression that 12 more were added in 1619, but the number could be 11 if Jordan’s Journey replaced Diggs His Hundred instead of joining it. At any rate, by the end of 1619 the colony was doing well enough to cause concern among the Native Americans, who no doubt feared that these English successes would trigger an even greater inflow of Europeans onto Indian land. English progress showed everywhere, and profit appeared in the eyes of the settlers. Apparently in response to this growth, officials decided in 1619 that the plantations and their periphery needed a government, so the House of Burgesses was created. Samuel Jordan and Samuel Sharpe, both survivors of The Sea Venture, were chosen as burgesses to represent Charles City. Samuel Jordan had the ability to concurrently run his plantation and carry out his legislative duties, having learned early in adulthood how to get things done. It was because of this, it appears, that his financial worth grew. However, Jordan by no means had to do everything at Jordan’s Journey. He had a plantation manager as an assistant, Captain William Farrar, to handle many of the matters. We will discuss Farrar and give a visual description of Jordan’s Journey later. For now, we can say that both of these facets of the Jordan story are remarkable in detail. Jordan almost certainly brought to Virginia common currency, which he would need to pay for transporting settlers to Virginia in exchange for their work. Once tobacco had been grown and cured, it could be used as currency. But before that, money or something clearly of value was needed in order to do business. We do not know whether Jordan sought more indentured servants, and we do not know how he would go about obtaining them. We noted earlier that Samuel Jordan seemed to have a sense of humor. We might add that he also appeared to have an upbeat personality. There is no record of that, but when we look at his actions we can imagine a man who smiled. In other words, we might surmise that he was often, perhaps always, in a good mood. His mood may have improved even more in 1620 when he married his second wife, Cecily Phippin Reynolds Baley. He may have seen her in 1611 when she first arrived in Virginia as a widow bearing the name Cecily Reynolds, with her 5-year-old child, Temperance. Both came along with Cecily’s aunt Joan and Captain William Pierce on The Swan. While she was living with the Pierces in Virginia, Thomas Baley asked her to marry him, and she agreed. The year of that marriage is unknown, but Cecily became a second-time widow when Thomas Baley died – a victim of malaria. At some point after Baley died, Samuel Jordan expressed interest in Cecily and freshened up on his courting skills. Note: Before we go any further we should mention that Cecily’s name has been spelled numerous ways, including Cicely and Sisley, but we are going with Cecily since it was the most common spelling for her name in records, although Cicely is common today. There was no standard spelling in the 17th century. William Shakespeare, for example, spelled his name in a variety of ways. Most sources say Cecily was beautiful, enchanting and mysterious. There are no descriptions of Samuel Jordan, but he no doubt had a command presence and would be attractive for that reason if none other. After being a widower 10 to 15 years, Samuel married Cecily Phippin Reynolds Baley about 10 years after he arrived in Jamestown. Most Jordan researchers have reported that Cecily was a lot younger than Samuel. Just how younger is a big question. In fact, she could have been as little as two years younger. But here comes the murkiness of trying to reconcile dates with what appear to be facts. When dates, facts and theories cannot be reconciled, it stands to reason that something is wrong with the alleged facts. from that marriage: Owen Phippen and Cecily Phippen, and as we know, Cecily married first Thomas Reynolds, then Thomas Baley, then Samuel Jordan. Placing Cecily’s birth year at 1593, as LDS and Waters report, seems somewhat reasonable if her first child, Cecily Reynolds, was born around 1605, as some researchers contend. Motherhood at such an early age is not unheard of. The Independent, a London publication, reported in 1997 that an 11-year-old girl from Dorset became pregnant and at age 12 gave birth. The father was 13. It is only of coincidental interest that this girl and our Cecily lived in Dorset, or Dorsetshire, as it was originally called. But if we are to believe the report that Thomas Reynolds was born in 1564, that would make him about 41 when Cecily gave birth about 1605, and that is contingent upon the reported birth year for her by LDS being correct – which it appears to be. Given that, it seems that Cecily preferred older men from the start. Whatever her age when she first became a mother, the consensus is that she was much younger than Samuel Jordan when she married him. As we noted, 1593 seems to be the best choice for her birth year. If that be the case, she would be about 15 years younger than Samuel, who reportedly was born in 1578 – also in Dorsetshire. It goes without saying that Cecily’s first two husbands didn’t live very long. Neither did Samuel who lived about three years as her husband and then died in March 1623 at the approximate age of 45. Cecily is reported to have had a daughter with Samuel, maybe two, and the name of one was either Margaret or Margary. Reports differ. Among Cecily Phippen Reynolds Baley Jordan’s talents was the ability to hold her own in business deals. When she married Samuel Jordan in 1620, they jointly received a land grant of 450 acres, and they were careful to point out in one record that both were ancient planters, settlers who had been the very first colonists and planters. This apparently was part of the requirements for receiving the grant. The title ancient planter seems rather odd to the modern ear, but it no doubt carried a different connotation in the 17th Century. Check the dictionary and find that ancient and venerable are synonyms. Then look up planter and find that its second definition is settler. Therefore, ancient planter in those days could mean the same as venerable settler does today. The word ancient was commonly used for a variety of purposes. Ancient of Days, for example, is one name in the bible for God. Daniel of the Hebrew Testament had a vision of Ancient of Days, a depiction of God as a venerable old man sitting on his judgment throne. In the Church of Jesus Christ of Latter-day Saints, the title belongs to Adam, the oldest man. There is a hymn called Ancient of Days, and the same term appears in the hymn Come Thou Almighty King! And there is the haunting poem called of The Rime of the Ancient Mariner by Samuel Taylor Coleridge – one of the most engaging stories in all literature. Cecily Jordan was one of 21 women recognized as ancient planters or venerable settlers while still living. This is a detail concerning women in American history that has been overlooked by most historians. By all accounts, Cecily was an enchanting enigma – quite a beauty and exhibiting tenderness, toughness and mystery. She was highly favored by men and befriended by women. She was reported, for example, to have been good friends with Temperance West Lady Yardley, wife of Sir George Yardley, who was then governor. In the next several paragraphs we will disclose some of the more sensational accounts about Cecily and the goings-on associated with her. We cannot attest to the accuracy of these accounts, but we can attest to the fun they generate. Cecily always seemed to be up to something, or the people around her were up to something. Samuel Jordan’s body was hardly in the ground before suitors started competing for her attention. Among the suitors was the man who preached Samuel’s funeral, the very amorous Grivell Pooley. From all accounts, Preacher Pooley worked himself into a frenzy over Cecily, and although she did not discourage his efforts she eventually spurned him, and that hurt. We have no reports on the quality of his preaching during this period, but we all can imagine. Actually, Cecily didn’t exactly spurn the parson. She revealed to him that she was pregnant and did not want to marry for that reason, and also because Samuel had been dead only three days. Directly, Cecily became engaged to Captain William Farrar, manager of Jordan’s Journey and member of the Virginia Council, but Preacher Pooley was not the sort to go softly into the night. He filed a formal complaint in the House of Burgesses. In testimony in connection with his legal challenge, Preacher Pooley claimed that he had betrothed Cecily to himself three days after he preached Samuel Jordan’s funeral. Witnesses testified that the idea of marriage seemed to be the preacher’s, not Cecily’s. She was reported as saying that the preacher was about as good as any other man around but noted that she was not interested in marriage at the time. But the preacher was on a roll by now and proceeded to recite her marriage vows for her, kiss her, and share a glass of wine with her. Witnesses testified that she had not said “I do” at any point during the parson’s performance. The dispute became perhaps the most controversial case to reach the House of Burgesses, and the burgesses promptly dropped it like a hot potato and sent it to London where the case eventually was decided in Cecily’s favor. The House of Burgesses, meanwhile, passed a law forbidding any woman in the future from promising to marry more than one man. It is not clear what that meant, although we probably know what the burgesses intended. Anyway, Cecily went ahead with her marriage to William Farrar, but the strangeness of all this does not end here. Cecily then revealed to listeners a vision she had one night at Jordan’s Journey. She said she saw two hands, one pointing at her and one pointing at her youngest daughter, while she heard a voice repeat the word judgment several times. Certain colonists more attuned to spiritual matters told her that she must have been dreaming, but she insisted that she was wide awake when she had the vision. No one came forward with a suggestion as to what it all meant. Captain Farrar and Cecily Farrar had two sons: Captain William Farrar Jr. and Lt. Col. John Farrar. The elder Farrar is believed to have died about 1634. By now, Cecily was just getting started. We have no documentation on this, but some researchers say that Cecily married Peter Montague after Captain Farrar died, perhaps in 1638. This conclusion is deducted in part from the 1659 will of Peter Montague in Lancaster County, VA, mentioning his wife Cecily. It seems that by now, Cecily was a prime candidate for filling any missing link. Many researchers say that the Cecily in question had five children by Peter Montague. Then Montague died. But back to Samuel Jordan. Like Cecily, he was born in Dorsetshire, according to most accounts. Most sources say his father was Thomas Jordan. It turns out that the Jordans and the Phippins in Dorsetshire were related, and Samuel is said to have been Cecily Phippin’s first cousin, one generation removed. The name of Samuel’s first wife, according to one source, was Frances, but we do not have confirmation on that, nor do we have a surname to go with it. Samuel is said to have fathered six children by this marriage. These children were reported to be Joane Jordan, born about 1597; Mary (nee Anne Marie), born about 1597; Robert, born about 1598; Daniel, born about 1599; Thomas, born in 1600; Samuel, born about 1608. Joane Jordan is believed to have died before 1633; nothing else is known about her. Anne Marie Jordan married Nathaniel Basse of Middlesex in 1613 and at some point she changed her name to Mary. Robert Jordan was killed during the Powhatan Massacre of 1622 at Berkeley Town and Hundred, which was on the north side of the James River across from Jordan’s Journey. There is no information concerning Daniel Jordan’s life or death. Thomas Jordan is said to have been born in Wiltshire, which is a departure from the often repeated Dorsetshire concerning the Jordan family in England. We do not know which was correct but tend to side with Dorsetshire. Thomas Jordan died in either 1685 or 1688 (reports differ), in Isle of Wight County, VA.
William Jordan was included in the Powhatan Massacre death list, but we do not know what relationship, if any, he had to Samuel Jordan. Also on the death list was William Basset (possibly Basse), but whether he was related to Nathaniel Basse is not known. Peter Jordan was also on the death list, but his relationship to Samuel Jordan, if any, is not known. Information from a Jordan researcher shows that Samuel Jordan, son of Samuel, came to Virginia around 1620, returned to England in 1624 to study at All Souls College at Oxford and returned to Virginia in 1626. As colleges go, All Souls today is no slouch. Samuel Jordan was in Virginia about a decade before any of his children. Reports show that he was a widower when he arrived in Jamestown. There is no clue as to how the children were cared for during his absence in the New World. Thomas Jordan came to America in the ship Diana but the year is in question. One source says 1618, another says 1623, the same year that his father died in Virginia. Like his father, Thomas Jordan also served in the House of Burgesses. Thomas served in 1629, 1631 and 1632. He apparently, however, did not take over his father’s plantation. Cecily, no doubt, had other plans. Instead, he is reported to have settled at Warrosquoyacke where his brother in law, Nathaniel Basse, and sister Mary (Anne Marie), lived on the Basse plantation called Basse’s Choyce. Thomas married Lucy Corker, daughter of Captain William Corker. Thomas Jordan died either in 1685 in Isle of Wight County, VA, or in 1688 in Surry County, VA. Reports differ. …All gentlemen of birth, virtue, and industry, and of the Council there, suffered under their cruelty and treason. Stanard surely knew that the Native Americans had by no means pledged allegiance to the invading Europeans, yet she proceeded to called their well-planned and well-executed assault “treason.” And Stanard damns Opechancanough for his cruelty and craftiness. Yet she does not mention the poisoning of more than 200 Indians during bogus peace talks and then shooting about 50 more. This poisoning expedition, led by Captain William Tucker, ranks as one of the worst ever examples of chemical warfare. It also puts Dr. John Pott, the Jamestown physician who prepared the poison, in the same company with Dr. Josef Mengele, the Auschwitz “angel of death.” Although Mengele’s actions were on a larger scale, both Mengele and Pott committed crimes against humanity. Opechancaough was by no means guiltless. He was a brilliant military strategist but he also committed immoral acts when he targeted children as well as men and women. Both sides were wrong. But the impetus for it all was the incursion of Europeans onto Native American land. As the Jamestown settlement became more prosperous and viable around 1620, Opechancaough surely knew that more Europeans would be on their way and take over all their land. Thus, he had to act. He had no choice. His error was in some of the methods he chose to carry out the assault. Carl Bridenbaugh, a fair-minded historian, gives an entirely different account of the Powhatan insurrection in his 1980 book Jamestown 1544-1699. He paints a picture of Opechancanough as a highly intelligent and European-educated man who was taken to Spain after a Spanish ship landed in Chesapeake Bay in 1561. He was there five years and was thoroughly educated by Jesuit priests. He observed Spanish life and customs and discovered European diplomacy and patience, which he incorporated into his overall plan that ended in the 1622 insurrection. He later went to Mexico but the Spanish governor refused to let him leave for the north. He was in Mexico three years and then returned to Spain to further his education with the Jesuits for three more years. Eventually he was allowed to return to his homeland as a missionary and interpreter, since he no doubt spoke fluent Spanish. He later reverted to his native customs, such as having more than one wife. When the Jesuits learned of this, they severely reprimanded him, and before long he denounced Christianity, apparently because he observed and felt the misery that the European Christians caused. He knew that if the Native Americans survived the European incursion, they would become second-class citizens and would have to resort to the hypocrisy of pretending to be Christians. He soon terminated all contacts with Europeans and warlike Christians, mainly because both posed a serious threat to the Indian way of life. Much good has been achieved by Christianity over the centuries, but its basic message of peace has been perverted into a justification for exterminating all Indians who would not kowtow. At some point after 1607, perhaps after 1613 or perhaps after 1618 when Powhatan died, Opechancanough, his older brother, began to devise a diplomatic and military strategy with the intent of expelling the invading English settlers. The diplomatic undertaking involved secret talks with the various Native American nations with the intent of forming a formidable allied army. He planned to wait until the right time to attack, and this took patience, an art he learned in Spain. The large-scale cooperation among the Native American kingdoms under the leadership of Opechancanough was unprecedented. Before this, Indian raids occurred only when one Native American kingdom decided to strike quickly and retreat almost as quickly. It was quite obvious that Opechancanough used his education to gain the advantage, which would be needed for an all-out attack History confirms Opechancanough’s perception of English motives. One of the chief aims of The Virginia Company was to subjugate or drive out all Native Americans from their homeland. However, the Puritans who were sprinkled among the population sought peaceful coexistence. But Opechancanough correctly concluded that the good intentions of the Puritans would last only as long as their basic needs were met. As part of his deception, Opechancanough attended the wedding of Pocahontas and John Rolfe, and according to Carl Bidenbaugh, gave the bride away. His aim was to make the English feel as if the Indians were supportive of their cause. Anyone among the English with a grain of common sense would know better, and there was one man who fit that description: Samuel Jordan. After the successful Powhatan preemptive assault on March 22, 1622, Opechancanough was recognized across the sea for his deceitful but effective diplomacy and military genius, and Samuel Jordan was admired at home for his well-planned defense of Jordan’s Journey. Opechancanough outlived Jordan by about 20 years, but the Powhatan commander’s days of glory began to diminish not long after the 1622 attack. The colonists struck back with equally deceitful and bloody revenge in which children were targeted. The colonists also undertook to weaken the resolve of the Indians by burning their corn crops and their houses. Yes, the Indians had houses, and some historians say these houses were superior to English houses. Following Jordan’s noteworthy accomplishment, Governor Francis Wyatt decided that Jordan’s Journey could remain in operation while most of the other plantations were abandoned indefinitely – as much as a year or more. 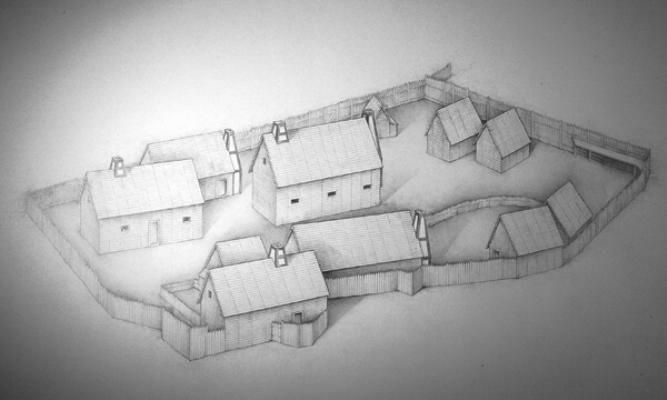 This was a defensive move in which colonists were told to cluster around Jamestown in the event of another massive attack by the Powhatan alliance. After Jordan’s death in March 1623, a year after the Powhatan assault, his plantation manager William Farrar, Cecily Jordan’s husband-to-be, was issued a warrant to bring in the account of the Jordan estate. A separate warrant was issued to Cecily Jordan, ordering that Farrar put in security for the performance of her husband’s will. We could not locate a copy of the will. We noted earlier that Captain William Tucker led a force of 12 men into Indian territory for spurious peace talks, proposed a toast, and succeeded in poisoning about 200 Native Americans. He and his men then shot and killed about 50 more. This act of revenge may be unparalleled in American history. It went against all that America has ever stood for, and the Jamestown physician who concocted the poison was severely criticized and eventually discredited as a politician and physician. His criminal act was worse than Tucker’s because his sworn duty as a physician was to save lives, not to take them. It is interesting to note that this poisoning occurred on May 22, 1622, two months after the Powhatan assault on March 22. At first blush it appears as if the date was coincidental, but after more consideration, we might conclude that the date was selected by colonial leaders for morale purposes, to demonstrate to themselves, if to no one else, that they would not abide such assaults as the one on March 22, 1622. Opechancanough was shot in the back and killed in 1644 at the approximate age of 100. Some reports say a colonist did this on the streets of Jamestown. Others say a jailer did it after Opechancanough was captured. No matter which version is correct, the cowardly deed was by no means a proud moment in American history. The excavation report notes that the area where Jordan’s Journey was situated was first occupied by the Weyanokes, part of the Powhatan alliance and one of the many relatively small Native American kingdoms throughout the region. In a nutshell, the excavations exposed a fortified compound containing 11 structures and an associated cemetery dating to the early 17th century. We will describe only a few of he structures here. Structure 1 was an earthfast building measuring 55 by 16 feet. 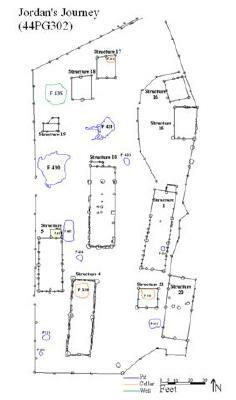 The building was divided into three bays of 18 feet each with a five-foot shed at the building’s north end. A hearth and possible chimney hood was suggested in the middle room. Structure 1 was the largest building on the site and was used as a dwelling. Structure 5 was an earthfast longhouse reported to have measured 37 by 16 feet in the 1992 report and 36 by 16 in the 1993 report. The building had a shed measuring 7 by 8 feet at its northeast corner, and was possibly divided into two equal size rooms with two probable door openings on the east wall. Hearths probably existed in both rooms. The structure intrudes an early lime kiln. Structure 15 measured 22 by 14 feet and may predate the palisade enclosure, since it appears to be incorporated into the palisade. A door may have been located in the southeastern corner of the building’s south gable end. Archaeologists at the site speculated that this building served as a stable, a livestock barn or a tobacco barn. We would wager it was a tobacco barn. If anyone has smelled a stable or livestock barn, he knows that these two structures likely would not be part of a closed, fortified compound. The stench and the number of flies would be too great for any semblance of comfortable living. Structure 17 was a small earthfast building, measuring 16 by 12 feet. A small cellar was located in the northeast corner of the building. The cellar contained many domestic items, including fireplace tongs, a flatiron, a brass skimmer, a knife, animal bone, a redware pot, a Ming porcelain wine cup, beads, an ear bauble, pipes, a spur, shot, a shot mold, gun parts, bandolier cap, plate armor, burned daub, and bale seals. The feature also contained Native American ceramic shards that may represent colonial use of an Indian pot. Archaeologists believe that this building could have been the original colonial house at the site, predating the palisade. If so, that could mean that this small structure was Beggar’s Bush. The spur mentioned in the paragraph above most likely belonged either to Captain Samuel Jordan or to Captain William Farrar, both of whom were apparently of the gentry class. Anyone would have to be of the gentry class or higher in order to ride a horse. The odds favor Jordan as being the owner of the spur since he was at Beggar’s Bush, Diggs His Hundred and Jordan’s Journey about 10 times longer than Farrar. Twenty-four graves were found outside the palisade’s north and west walls, but one of the graves had two skeletons, which brings the number of people buried there to 25. Most of the individuals were not buried in coffins, and the graves were relatively shallow. We have already mentioned the lime kiln at Jordan’s Journey, so some of that lime most likely was shoveled across the tops of the shallow graves. More than half of those buried were 10 to 19 years old. Only two were over 30 at death. Hinges that may have been from a document box were found in one grave containing a male 35 to 39 years old. The archaeologists theorized that this might have been the grave of Samuel Jordan. However, the age is younger by five years than the earlier estimated age of about 45 when Samuel Jordan died. One or both estimates could be several years off the mark. Several other plantation sites have been excavated, apparently before subdivisions were built in the area, and they reveal items that call out for conjecture. Among these items were Woodland ceramics (very old at the time), gun parts, spoons, fork, knives, roofing tile from bone refuse, flooring tile of yellow brick, and red brick. Roofing tile offers a picture in the mind’s eye rarely seen before. Most historians, if not all, thought the early colonial roofs were thatch. Another surprise is the discovery of forks at Jordan’s Journey. By 1611 or so, forks were in use in England on a very small scale. Now we have forks from the same approximate time period at Jordan’s Journey. Before this the governor of the Massachusetts Bay Company kept a fork from about 1630 and proclaimed it to be the only fork from that general era. As we see, the Jordan’s Journey discovery has rewritten history. Death* before 1644� Before 1644 If this Thomas Jordan is Mary Jordan's father then this deed indicates that he was dead before 1644.